the beginning, originally uploaded by jahansell. They are brave and intrepid, these daffodil plants. They force their way up through soil that has hardened into a thick crust, through matted leaves and last year's weeds. They push against the snow pack so that by the time they finally outlast the winter and show themselves, they are bent and broken. But nothing stops them- they stretch and reach toward the sun - still thin and bleak now, but warmer every day. It takes forever, it seems, to get from here to warm May days with nodding blossoms, and then in a minute they're gone. But the anticipation changes my mood - the tension and tightness releases, I relax and stretch and reach toward the sun. Jenny, just beautiful imagery and commentary today. Thanks for that! 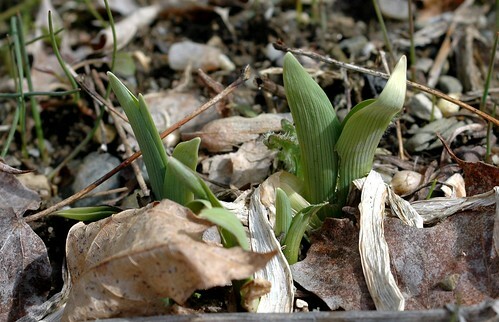 What a timing to capture the beginning of these young shoots after the cold winter. It's like the start of a new life! Great shot!